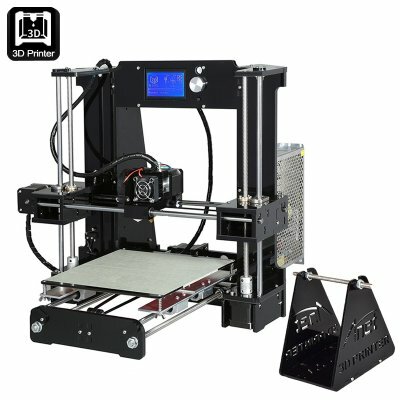 Successfully Added ANET A6 DIY 3D Printer Kit - Metal + Acrylic Frame, Multiple Filaments, 100MM Per Second Print Speed, Windos Mac + Linux Support to your Shopping Cart. The DIY 3D printer kit is the perfect and affordable way for to get into 3D printing. The ANET A6 DIY 3D printer is can be assembled without any prior technical knowledge. To make life easy all the connections are ready for plug and print meaning there is no soldering or crimping of cables and wires and to help you there are full instructions on the SD card that's included with the kit. With a respectable 220x220x250 mm printing volume, this 3D printer has an acrylic and metal frame ensuring a study structure that allows for precision printing to an accuracy of 0.1 to 0.4 millimeters. This 3D printer comes with the Repetier printing software, compatible with XP, Vista, Win7, Win8, Win10, Linux and Mac OS, which has tonnes of great online support and allows you to create or import 3D models that can be customized and printed quickly and easily. Great 3D printer. Comes in flatpack form so requires assembly. That is good though because that is part of the fun! This printer is working really well and I haven't had any problems with it. Not really a bad point, more a note: You need to buy some filament before you can start printing as it does not come with any.